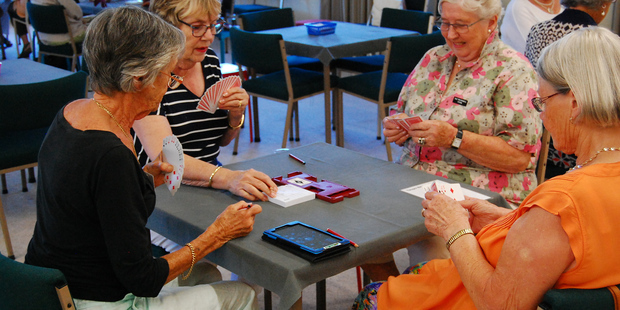 A recent major study has revealed that playing bridge keeps people smarter, happier and more social into old age. Taupō and Tūrangi Weekender editor Laurilee McMichael tries her hand at a few hands. It used to be accepted that as you got older, your brain power faded. But research in recent years has showed there are a variety of things you can do to stave off that process - learning a new language or playing an instrument, doing the crossword, making new friends are among some of them - and one of the newest discoveries is that the card game bridge can also help. 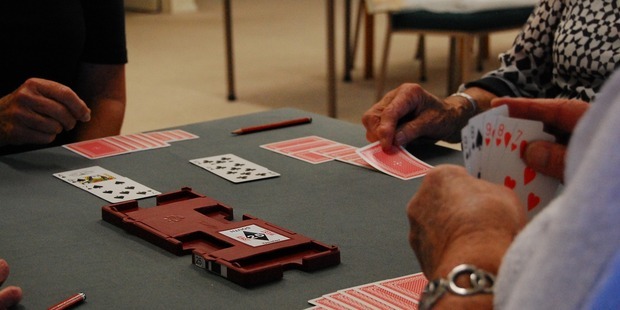 A recent major study by the University of Stirling, Scotland, has revealed that playing bridge keeps people smarter, happier and more social into old age. The study also indicated that people who play bridge have higher levels of wellbeing than those who don't. In addition the game and its social environment has the potential to maintain good health, through increased positive cognitive, social and quality of life outcomes. It's with this in mind that I ventured along to one of Taupo Bridge Club's regular supervised bridge sessions, held every Wednesday afternoon at the bridge club's rooms on Tauhara Rd. Here, people who are learning bridge or who want to practise or refresh their skills after taking a break can enjoy the game in an informal social environment. There are some similarities with the card game 500 in that the aim is to win tricks, but in bridge the bidding adds a whole new aspect to the game and as a result it takes a bit of learning - which is where bridge being good for your brain comes in. You can play bridge without being very smart and very smart people can also be terrible at bridge. In The Netherlands it is actually taught as a school subject because the students learn social skills, problem solving, etiquette and interacting with others. 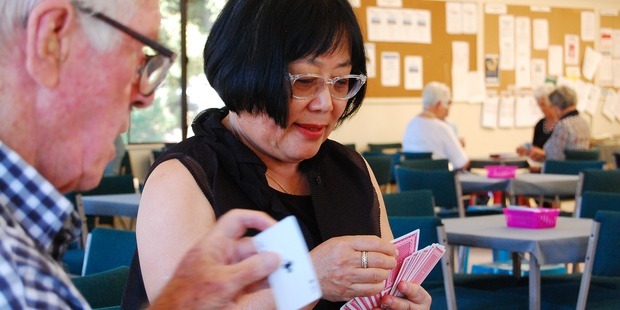 The first step to playing bridge is learning, and the club's bridge guru and president Rona Driscoll runs learn to play bridge classes for newcomers. From there, they can move on to supervised sessions, where people play at about half the speed of normal bridge and can ask questions if they need to. Rona herself took up bridge in 2000 after deciding golf wasn't for her. "I was never any good at sport. I was in Wellington at the time and I saw the ad in the paper and thought I'd give it a go. What I like about bridge is you can see where you went wrong. You can see the cards and say 'if I had played this, then this would have happened'. With golf you have no idea. I never looked back." Rona says playing bridge is life-long learning and that is why scientists have discovered that it's also good for the brain. "The thing about bridge is that if you want, you can just keep learning. You can just learn the basics and play at home or play it at much more advanced levels, it's still the same game." After moving to Taupo, Rona got her husband John into bridge too. Now they play a lot of bridge competitions and tournaments together. Rona says the thing she loves about bridge is the challenge but also the social aspect. "Winning is fun but you can also learn a lot and whatever you do, you can achieve something. You either win or you learn or you enjoy yourself, or all three. "You can play the top players in New Zealand or the world champions and what other sport do you get to do that in?" Rona says there's no particular skills required for bridge but it does help to make a plan. Partners play as a pair so good communication and teamwork is also key. Nationally, about 14,000 people play bridge and like many clubs, its membership is ageing, although the Taupo club, which has about 200 members, is in good heart. Today I've come for a go at the supervised bridge session. I've never tried the game before but I have played 500 so I understand the concept of tricks and trumps, which is a start. However unlike family games of 500 with my in-laws which normally involve a lot of banter, name-calling, swearing, and a few drinks, bridge is a more serious affair. There is plenty of affable conversation before and after but during play itself, it's pretty quiet. Despite that it's a very sociable pursuit, player Barbara Cook says. When she was on holiday in Hawaii she and her companion found a pair of people playing bridge and joined the play, having a wonderful time. She says bridge can act as a door-opener in other towns or when travelling. Looking at the club noticeboard, I see there's even such a thing as bridge tours, where you travel and also play bridge. A supervised play session like this one is shorter than a normal bridge session. About 24 pre-dealt boards or 'hands' of bridge are usually played. The key to these sessions is that they are replicate, meaning each group of four players will, if time permits, get to try each board. The boards remain unchanged and so afterwards they can compare results to see how different players bid and played each board. I am told more than once by players that Taupo is very lucky to have this level of support for new players. Most clubs chuck people in the deep end and expect them to work it out by themselves. I'm shadowing player Pamela Frank, who does the bidding, which is the trickiest part, and then generously allows me to play out her hands, with the lead switching around as the hands are played. "The whole thing is about communicating with your partner what you have in your hand," Pamela explains. "This is one of the complexities of the game." We lose the first hand. Damn. To be honest, it was a pretty bad hand, but it sets the tone for the rest of the play. Barbara, Pamela and I are unable to even bid because our hands are consistently dogs, although we do manage to take down the other pair a couple of times when they can't win the number of required tricks. However, I'm told the score you get at the table doesn't actually matter. Each hand, or board, of bridge is passed around the tables and how you play it is compared against how the other players use the same cards. That means your opponents who are sitting at your table with you can affect your play but are not actually your competition. It's the other player sitting in the same spot as you but at another table who you need to beat. I never do get to find out how well I did because I have to leave the session just as I was really starting to get into it. Perhaps it's just as well. I've heard bridge can be quite addictive, and as a competitive person by nature, I can see the appeal. Because in bridge players must make decisions based on incomplete information (they don't know what is in their opponents' hands), Rona says that's what makes bridge fun. "There's a lot of inference and the better you are at inferring and working things out, the better your bridge will be. You don't have to be good at memory and all that sort of stuff. You can play bridge without being very smart and very smart people can also be terrible at bridge." 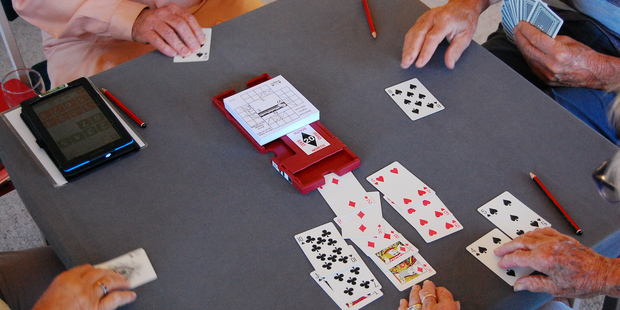 •Learn to play bridge lessons are currently running every Tuesday at the Taupo Bridge Club. To find out more, visit www.taupobridge.nz.